Yet upon experiencing a recent death of a family member, close friend or teacher, or when remembering days gone by – the reassuring glances, kidding around or a gentle touch – we wonder: How might our reminiscences and grief coincide with the abundance of holiday cheer? We are encouraged to be happy, merry and joyful, and we can be, as memories are shared and feelings accepted (and not repressed). Holidays remind us that we are part of the cycles of a living Earth, and for a while we are in sync with those we love. Yet we can do more than just remember – our memories beckon us to be and do better, simpler, kinder and fairer. Every year, some celebrate Christmas – the birth of Jesus and renewed hope (after some closed their doors to his laboring mother). Some celebrate Hanukkah – the survival of the underdog in the face of political annihilation. Some celebrate Kwanzaa – the freedom and restoration of family and community after centuries of persecution. Some celebrate Pancha-Ganapati – the mending of past mistakes and repairing relationships with family, friends and others. Each of these celebrations remind us of life’s fragility in the face of adversity and loss. For children who are bereaved, holidays can be especially confusing times. The animated short, The Snowman and The Snowdog, may help. Film director Hilary Audus and colleagues created an enchanting sequel to the 1982 Academy Award winning classic, The Snowman, based on an original story by Raymond Briggs. [Spoiler Alert] The Snowman and The Snowdog opens by illustrating the tender affection between a boy and his old dog. 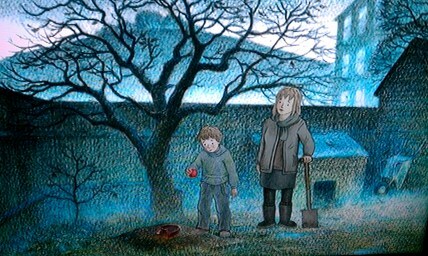 One scene later, mother and son are seen standing in their backyard beside their dog’s freshly-dug grave beneath a leafless tree (see illustration, above). With a Christmas snow, the boy builds a snowman and also a snowdog. After midnight, both come to life, and the three of them have marvelous adventures. By the film’s end the boy faces death once more when he finds the remains of his snowman melted in the morning sun. The warming sun which chases the chill from our bones also brings the demise of a magical friend. This film offers more complexity than the first: it begins with death and bereavement, and throughout deals with memory across time and space, expanding vs. replacing relationships, and more subtly, ideas of transformation, resurrection, reincarnation, and love. It further rattles conceptual boundaries between animality and the imaginary as only animation can – it is a cinematic poem without words (except for its theme song). The Snowman and The Snowdog recognizes that magic can arrive from the sadness in our lives, especially heightened during the holidays. As a gift to our readers, I’ve attached this film below; you may also find it in our video gallery. Please share it with a someone who might be comforted by its charm. During this past year, the Green Pet-Burial Society has continued to add content to our website, Facebook page and Twitter account, and has been quietly engaged in various scholarly, artistic and advocacy projects as we prepare for big announcements and changes. Your generous donation, in any amount, will ensure that we continue to offer comfort and support to the bereaved, provide resources to scholars and stakeholders, and advance the option for Conservation Whole Family Cemeteries worldwide. This entry was posted in animal, animation, burial, Christmas, companion animal, compassion, empathy, green burial, Hanukah, Holiday, Kwanzaa, Pancha-Ganapati, parable, pet, pet burial, poetry and tagged animal, bereavement, dog, grave, grief, Inspiration, nature, The Snowman and The Snowdog by Eric Greene. Bookmark the permalink. At the end of every year, many people deal with a recent death, and many more remember those who are no longer here. Yet such struggles may continue at the beginning of the year as well, as we move forward in time. This blog is from the Green Pet-Burial Society, which is a program of our Families with Animals division. Thx for this, it represents xmas to me, the flying part bought tears to my eyes. Xmas for me if Im celebrating any kind of generative spirit is celebrating my god dog Beulah, an enigma who is gone but wont let me forget, for he visits in dreams with coyote friends (who I assume were persecuted by man AKA the devil) commanding me to be part of the AR movement (from which i shy, as its disturbing). Real visitation or some wishful psychosis, I cannot say. Either they do live on (offends my scientific beliefs) or they inject some of their superior character into us. You talk of animals as teachers, that understates lol. Can we hyperbolise just a bit… gods… start a new religion maybe 🙂 Whoever made this video has understood how our attitude starts out and should continue, fresh new child and wise dog – magic to make spirits soar. Rachael, we’re so glad that this film means so much to you! Who would expect that a film dealing with death can offer such hope – a hope that comes from inspired people like you who help others. While we see people, in real life, who hurt other humans and other animals, there are many others who say, “they are family,” and that chorus is getting stronger.